Help us bring our ambitious program of exhibitions and activities to the community. SFMOMA volunteers perform a variety of duties, from helping visitors find their way through our building to checking people in at events or assisting behind the scenes in our offices. Volunteer positions fall into four general categories: administrative support, onsite event and exhibition help, and private tours assistance. SFMOMA’s passionate and generous volunteers are indispensable to achieving our goals as a museum. Join this group of talented individuals and contribute your time while gaining skills and a working knowledge of the museum world. Candidates should be flexible and ready to assist wherever they are needed. A commitment of at least six months and availability to work at least one shift a month is required. Most shifts occur in the evenings and on weekends. Two new volunteer orientations are held each year. All volunteers must be 18 years or older. 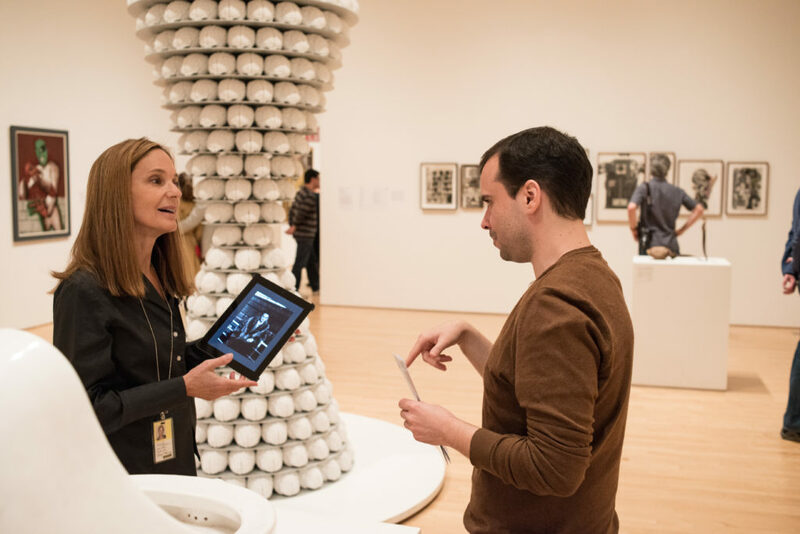 If you’re interested in becoming an SFMOMA volunteer, please complete a volunteer profile by clicking on the “Browse Current Opportunities” button and registering for an account. We’ll be in touch to arrange next steps. SFMOMA volunteers support the museum’s mission to bring the art for our time to life in imaginative, inspired, and lively ways. Some have an extensive background in art while others are newly curious to the field. They are over the age of 18. Many volunteers are interested in developing specialized skills and gaining experience as part of a professional path; others are drawn to the opportunity to inspire others through the experience of art. Aside from the numerous benefits listed above, volunteers have the opportunity to explore a field they’re interested in while gaining practical museum skills. Volunteering is also a great way to get involved with the community and meet new people. Not necessarily. If you hope to volunteer in supporting tours or working with visitors, it can be helpful to be familiar with relevant terminology and history. However, there are many volunteer opportunities where prior knowledge isn’t required. The most important qualities we look for in volunteer applicants is a positive attitude and the willingness to be a team player. Are all volunteer candidates accepted? While we work hard to place each and every applicant, it’s not always possible to find an assignment that is a fit for both the applicant and staff. We encourage volunteers to be flexible in contributing where they are needed in the museum. What time commitments are required from volunteers? We ask for a commitment of at least six months and the availability to work at least one shift per month. Shifts are primarily in the evenings and on weekends, but vary based on volunteer position. If you are interested in volunteering, please complete our online application. Due to the large number of applicants, not all volunteer applications will be successful. Every day, SFMOMA’s museum guides initiate dialogue, foster discovery, and open the eyes and minds of our visitors.